Neotropical snakeferns (Microgramma, Polypodiaceae) are handsome, interesting and easily-grown additions to almost any plant collection. Many of the species have intricately-patterned leaf veins that resemble fanciful calligraphic scrolls or inked Art Noveau embellishments. They are unobtrusive and gracious bay window, sunroom and greenhouse guests that are very forgiving of minor cultivation errors. They are also fairly fast-growing; in a surprisingly short time span, most species can be grown to fill 6”/15 cm basket size from fairly small established starts. Above, leaf details showing the very attractive reticulate vein patterns of three very distinct members of this genus. Microgramma nitida (top), M. brunei (middle) and M. squamulosa (lower). They are characterized by their relatively frond size in most species and dimorphic but undivided fronds with poorly-defined or many-divided lateral veins. They have single rows of round or elongated/fused sori located on either side of the midvein, and long, creeping or vining scaly rhizomes that are studded with single/simple leaves. While mostly encountered as epiphytes in nature, they also grow as lithophytes and occasionally as (windfallen?) terrestrials. The five remarkable species with punctate rhizomes and that develop globular hollow tubers as domatia for ants, especially the epiphytic potato fern (Microgramma brunei), are much sought after by rare plant collectors. Although not closely-related, they form an interesting parallel to the Old World myrmecophytic polypod genus Lecanopteris that also have mutualistic relationships with ants and are likewise very popular in ornamental horticulture. Because many species of snakeferns are common throughout the Caribbean region, particularly in the Greater Antilles, they have been familiar to botanists for centuries. One species, the clubmoss snakefern (Microgramma lycopodioides) was first described by Carl Linnaeus as Polypodium lycopodioides in his “Species Plantarum” in 1753 apparently from a West Indian accession. Above left, the stout and scaly adpressed young rhizomes of Microgramma megalophylla. A petiole base is visible top center. Right, a Medusa-like knot of young M. nitida stems. One species, the clinging snakefern (Microgramma heterophylla), occurs in the U.S. as a very localized and threatened epiphytic plant in a few counties of extreme southern Florida, but is widespread and often common on islands throughout the northern Caribbean. About half of all described species are represented in cultivation as terrarium, conservatory and greenhouse plants. Recent introductions by nurseries in Colombia, Perú and Ecuador apparently include a few undescribed species. The plethora of invalid binomials in snakefern taxonomy indicates much more work needs to be done with the genus. They are excellent subjects for novice fern growers interested in diversifying their collections away from more commonly-cultivated terrestrial tropical fern species to ferns more suited to hanging basket cultivation. Several species that occur at upper elevations in Central America and the Andes have proven to be tolerant of temperatures into the mid-40s F/7 C. The more tropical species often develop unsightly black patches or leaf die-back when kept too cool. All are suitable as terrarium plants when small and appear to tolerate traffic over their leaves by small reptiles and amphibia quite well. An 8’/2.45 m long Microgramma vaciinifolia grown in a California greenhouse in a 10”/25 cm pot. This snakefern has had ~12”/30 cm trimmed from the ends of its longest fronds. Most of the more common species also make superb additions to wet walls and vertical plantings under warm, bright conditions. I have not had any species “weed” from spore in the greenhouse, but some of the faster-growing species will climb into and colonize neighboring pots when given the opportunity. I have grown several species to 6’-8’/1.90-2.45 m in length in 8-10”/20-25 cm pots, but under the right conditions in larger containers I am confident that the rhizomes of some snakeferns can easily reach 12’/3.80 m in length. I grow most of my species in pure New Zealand sphagnum moss, but other free-draining, moisture retentive acid media containing materials such as fine conifer bark and sphagnum peat + perlite blends also work very well. In terraria or greenhouses where they are subject to frequent misting, many species grow well on cork branches and treefern rounds. After starting them in smaller plastic pot and net baskets, I grow most of my collection in 6-8”/15-20 cm wooden baskets, plastic net pots or plastic pots. Once they begin to creep along the bench, these are equipped with hangers and suspended in a bright, airy location. These ferns respond very well to frequent drenches with dilute, balanced fertilizers suitable for orchids and other epiphytic plants. As is the case with most ferns, dilute fish emulsion (5:1:1) works wonders to accelerate growth in specimen plants, but many find the smell of even deodorized versions offensive and it will often attract vermin. Many species sold online without accepted names appear to be either geographic variants or juvenile frond forms of a few common species. Other climbing polypod genera that have species with thin rhizomes - such as Asian and Pacific tongue or dragon scale ferns (Pyrrosia species) and some of the smaller strap ferns (Campyloneurum species) - may also occasionally be sold as snakeferns. Despite leaf shape and rhizome similarities, they can be easily differentiated from Microgramma by their leaf textures and secondary vein arrangements. In the case of Pyrrosia, stellate hairs are also visible on the leaf surfaces under low-power magnification. Snakeferns are easily propagated from stem pieces laid on damp sphagnum moss and left covered in a warm, bright spot for eight to 10 weeks until they develop roots along their rhizomes. Once they have root systems, they can be loosely potted in plastic baskets filled with sphagnum moss until fully established. Recently cut stems of Microgramma brunei being propagated on damp NZ sphagnum in a transparent dome-covered nursery tray. Their primary pests are mealybugs and slugs. Both are easily-treated, but I find that drenches with systemic pesticides are more effective than sprays. Perhaps the finest species not yet in wide cultivation is Microgramma bifrons, a beautiful antfern from low to middle elevations of southern Colombia, Ecuador and Perú. The few northwestern Bolivian records apparently represent misidentified examples of M. bismarckii. Currently, I grow about a dozen species of Neotropical snakeferns in a greenhouse in California. All plants shown here are in the author’s private collection. Because several Microgramma species that I cultivate are myrmecophytic, I will treat these first. Mature specimen plant of Microgramma brunei in a California greenhouse. Microgramma brunei (subgenus Solanopteris), first described as a Polypodium by Christ in 1909 and ranges from Costa Rica to northwestern Ecuador. This is a tropical rainforest fern throughout much of its range, but in western Panamá it can be found in middle elevation cloud forest to 4,900’/1,500 m. It is a very widely-studied antfern, particularly at sites in Costa Rica. In nature it is known to be associated with the arboreal ant genus Azteca, which defend the fern aggressively when it is touched. 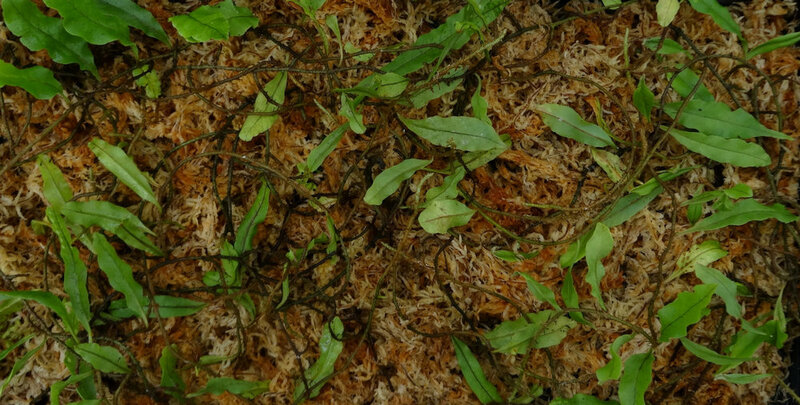 Microgramma brunei is the most commonly cultivated epiphytic “potato fern”, but it has a reputation for being difficult in captivity. I suspect this may be due to one or more maladapted clones being perpetuated in cultivation, because I have found it (in the guise of a very old ex-Marie Selby clone) quite easy under warm, moist conditions. Freshly-developed rhizome tubers vary in color from medium green to reddish-brown, depending on locality. As photos here show, this is a very desirable fern to have in any tropical plant collection and makes a great conversation piece because of its conspicuous, inflated, “hairy” domatia and attractive foliage. Above left, the bristly rhizome tubers of Microgramma brunei. Right, fertile fronds of this species showing sori details. A mature specimen of Microgramma bismarckii cultivated in a cool California greenhouse. Microgramma bismarckii (subgenus Solanopteris), is a cloud forest antfern known only from Amazonian drainages of central Ecuador to northern Perú at elevations between 3,900-5,200’/1,200-1,600 m. Other than a few very rare Lecanopteris species from Sulawesi, such as L. spinosa, this is the most obscure antfern that will be encountered in cultivation. Unsurprisingly, this species prefers cool to intermediate conditions and may require excellent quality water to thrive. I have not grown it warm, but growers in southern Florida have reported limited success with it there. The tubers are very striking, with thorn-like processes studding the glossy green surface. Unlike M. brunei, whose tubers are usually lightweight and have thin exterior walls, these domatia are invariably succulent and quite dense (see image here). Tubers darken in color to deep brown over the course of months. Above left, newly-expanded rhizome tuber of Microgramma bismarckii. Right, fertile fronds of this species showing arrangement of sori. Fully-formed rhizome tubers of both species are approximately 1”/2.5 cm in diameter and are hollow but infiltrated by fine roots from the outset. Herbarium specimens of Microgramma brunei from central Panamá and Colombia show multi-chambered domatia whose internal architecture differs substantially from the one shown here. Long days with very bright, airy conditions favor abundant production of rhizome tubers in both species. It is my experience that both newly-formed domatia and fertile fronds are most evident in the late summer through mid fall. Dissected older mature rhizome tubers of two cultivated Microgramma species, subgenus Solanopteris. Top, M. bismarckii and below, M. brunei. Note that the interiors of both tubers are well-infiltrated with roots. No ants have colonized these two plants. Other snakefern species that also produce conspicuous, inflated tubers along their rhizomes but that are rare in cultivation include M. bifrons, M. fosteri and M. tuberosa. Microgramma lycopodioides, is a widespread, variable and oft-misidentifed snakefern species that occurs from Oaxaca, México east to northern Belize and much of the Caribbean, then south to Perú where it may be found from coastal rainforest to middle elevation cloud forest. In the lowlands across its range it is often found growing on arboreal ant gardens or termite cartons where it may be found with other Neotropical myrmecophytes such as Anthurium gracile (Araceae), Codonanthe species (Gesneriaceae), peperomias (Piperaceae) and several Coryanthes and Myrmecophila orchid species. The plant I currently grow originated from a collection I made from an arboreal termite nest in lowland wet forest in northern-central Guatemala. This species, together with Microgramma heterophylla and M.piloselloides, are both the most popular snakefern species and those that have been in cultivation the longest. Above left, a very attractive Guatemalan lowland tropical form of Microgramma lycopioides grown in a warm greenhouse in California. Right, fertile fronds of this species showing details of sori. Microgramma megalophylla is an Amazonian rainforest understory climber that excels as a mounted plant and will quickly colonize a cork tube, grape wood branch or similar mount. Rhizomes are covered in dense white and tan peltate scales and can be woody and almost 2”/5 cm wide when fully mature. Arboreal ants utilize spaces that develop in older, woody stems between the rhizome’s epidermis and interior vascular tissue. This handsome snakefern ranges throughout lower elevations of the Amazon basin from Colombia and the Guyanas to Peru and Bolivia, from ~300’ to 2,250’/90-700 m, but mainly between ~500-1,000’/150 and 300 m.
Above left, a large cork tube colonized by Microgramma megalophylla grown in a warm greenhouse in California. Right, fertile frond of this species showing details of sori. Bulb pan filled with Microgramma heterophylla rhizomes. Microgramma heterophylla, is as mentioned previously, a Caribbean basin epiphytic fern that is widely distributed from the southern tip of Florida to Cuba, Jamaica, Hispaniola, Puerto Rico and the Virgin Islands. The leaf veins on this species are raised on the upper surface giving it a very distinctive appearance. Plants in the nursery trade originating from Andean countries under this name are misidentified. Microgramma nitida, is one of the larger-leafed snakefern species that is often encountered as a lithophyte on karst in nature at very low elevations When well-grown it is a beautiful fern for a large hanging basket, with blunt-tipped, glabrous, very glossy and almost metallic-looking fronds. Larger leaves may exceed 5”/12 cm in length. Despite being of easy culture. it does appear to be quite cold sensitive. Best known from Mesoamerica where it can be a common epiphytic or lithophytic fern on Gulf of México and Caribbean slope rainforests near sea level. Ranging from southern Tamaulipas state, México across the Yucatán Peninsula to Belize and Guatemala, then southeast across northern Central America to Panamá and south to Amazonian Perú. This is an exceptional species for growing on wet walls and other “vertical gardens”. Above left, a mature specimen of a Guatemalan Microgramma nitida. Right, frond detail showing the glossy upper surfaces. Microgramma percussa, is a wide-ranging species across southeastern México, much of Central and South America to northern Argentina. Except for populations in Bolivia, this species is mostly a wet tropical lowland snakefern. The fern’s leaves can be very variable and are attached by narrow rhizomes. Some forms are very attractive with the outline of sori being conspicuously “tattooed” on the upper leaf surfaces of fertile fronds, like those of M. lycopoides. Above, frond details of an Ecuadoran form of Microgramma percussa. Microgramma piloselloides, another extremely variable and wide-ranging snakefern species that is one that often appears in cultivation as “sp. Ecuador” or M. tecta. This fern is widely distributed from the northern Caribbean (Cuba) throughout much of the western slopes of the Andes from Colombia to Bolivia at elevations ranging from near sea level to over 4,200’/1,300 m.
Microgramma reptans, is a smaller species that has markedly dimorphic leaves when mature, with sterile fronds being ovate or nearly orbicular in shape, with interspersed fertile fronds being elongated and very narrow. It is also common across much of the Neotropics, from the Gulf coastal states of México, south throughout most of Central and South America at least to central Bolivia. Frond details of Microgramma reptans. Note the elongated fertile frond developing at extreme right. Microgramma squamulosa, is best known from south of the Equator in South America, mostly from Perú, Bolivia, Paraguay and Brazil, between 650’/200 m and 11,000’/3,400 m, but mostly in middle and upper elevation wet forests. This very beautiful epiphytic snakefern thrives under cool, humid conditions where its distinctively-patterned leaves make it a wonderful hanging plant to have around. Its conspicuously-veined elongated leaves make it one of the most beautiful species in the genus. It is very easy to grow as a basket plant under cool and intermediate conditions. Above left, leaves of Micogramma squamulosa grown in a cool greenhouse in California. Right, very vivid vein details of this species on a sunny morning. Microgramma vaccinifolia, is very widespread throughout eastern South America from Venezuela and offshore islands, south through Brazil, Paraguay to northern Argentina. Easy, very fast-growing and ultimately very long, although its size is easily managed via judicious pruning. I have found the clone that I grow oddly reluctant to produce fertile fronds despite its formidable size (>8’/2.45 m) after six years of cultivation. Above left, leaves and rhizomes of a large specimen of Microgramma vaccinifolia. Right, Leaf and rhizome details of this species.